It’s rhubarb season! The farmers’ markets are opening here in Minnesota this weekend, and that means rhubarb will be the main commodity of every table. Eager shoppers will stock their reusable cloth bags with this tangy stalk and hurry home to make the year’s first rhubarb pies, cakes, and other desserts. In the next few months when strawberries come into season, rhubarb sales will spike again, as ambitious bakers fill their ovens with strawberry-rhubarb this and strawberry-rhubarb that. Then, as the rhubarb mania starts to wane, and the thought of any more sweets makes our heads spin, what can be done with all the leftover rhubarb? It’s still for sale, and it’s still growing in our gardens. 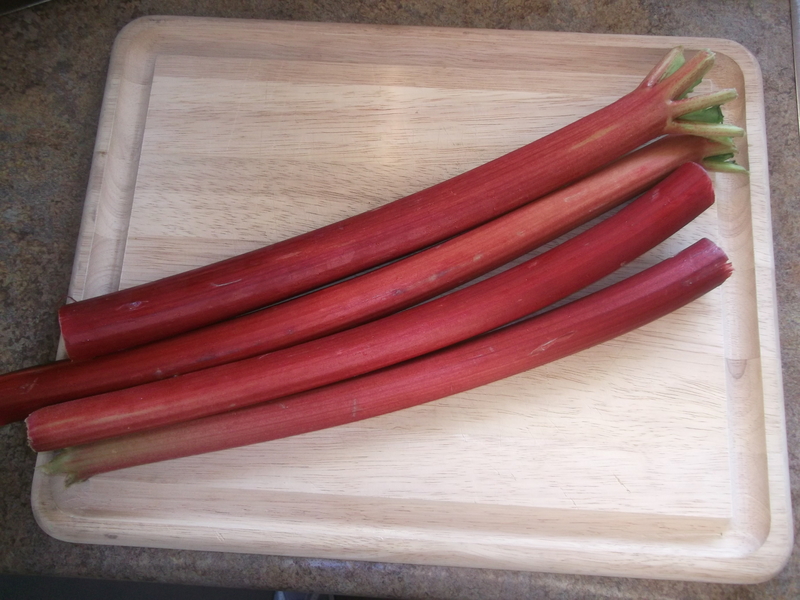 Those who grow it can no longer even give it away, having long since exhausted their neighbors’ palates with well-intended “gifts” of home-grown rhubarb. This recipe solves that problem. 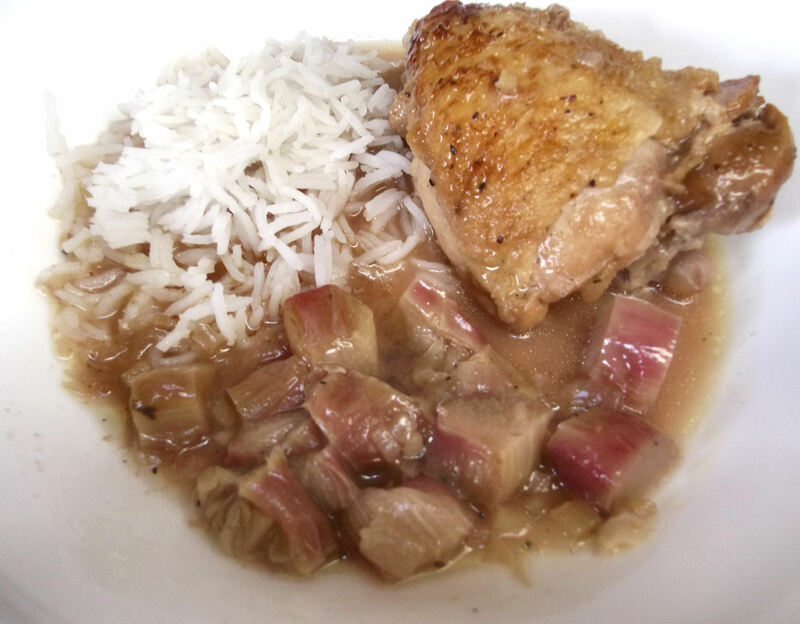 When you no longer have room in the freezer for the cakes, pies, and tarts, and no more room in the pantry for the jams, jellies, and chutneys, use up that rhubarb in a delicious chicken dinner! Pat the chicken dry with paper towels, then season generously with salt and pepper. Heat the oil in a large, heavy-bottomed pot over medium-high heat until shimmering. 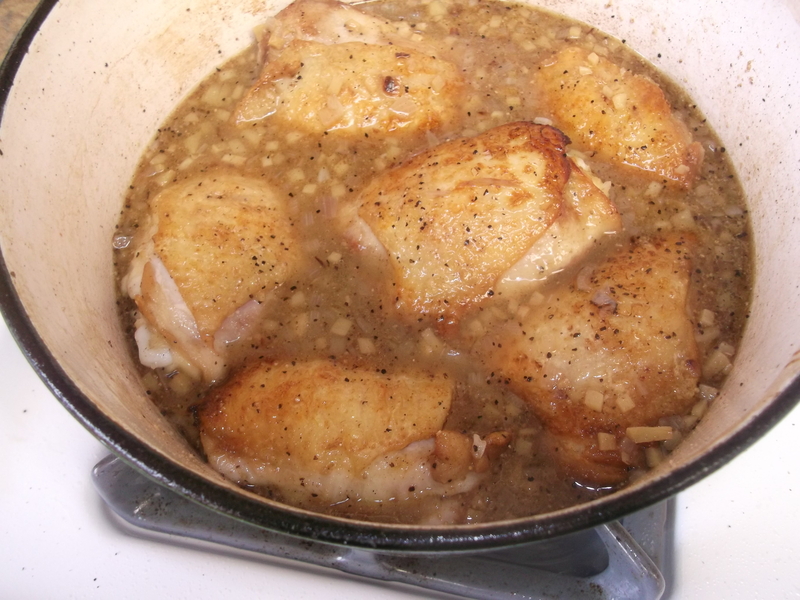 Place half of the chicken thighs in the pot, skin side down, and cook until golden brown, about 5 minutes. Flip and cook the second side until golden brown, about 4 minutes more. 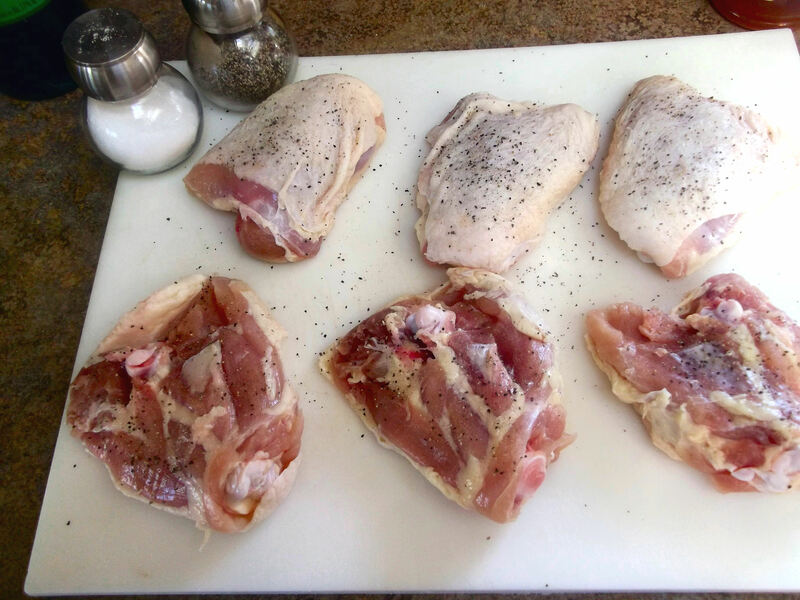 Transfer the thighs to a plate and repeat with the remaining chicken. Reduce the heat to medium and remove all but 2 tablespoons of fat from the pot. 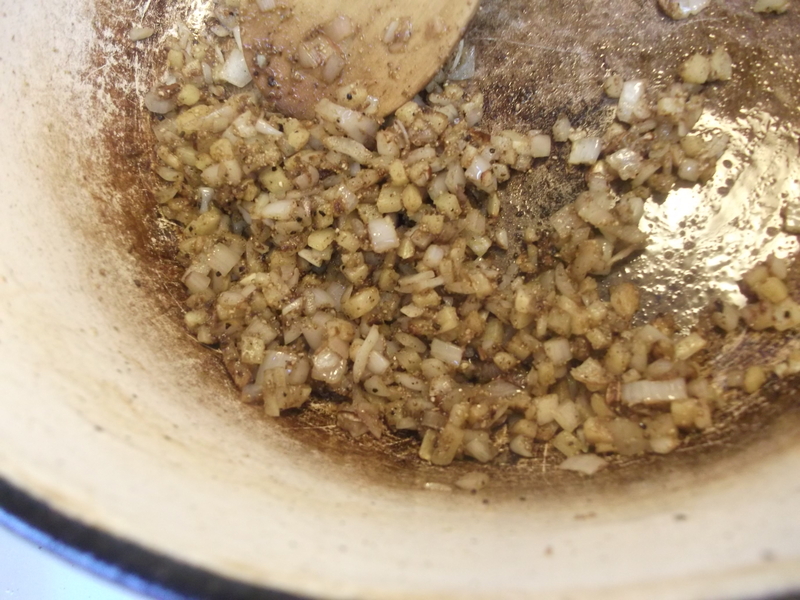 Add the shallots, ginger, and cardamom, and sauté until the shallots soften, about 2 minutes. 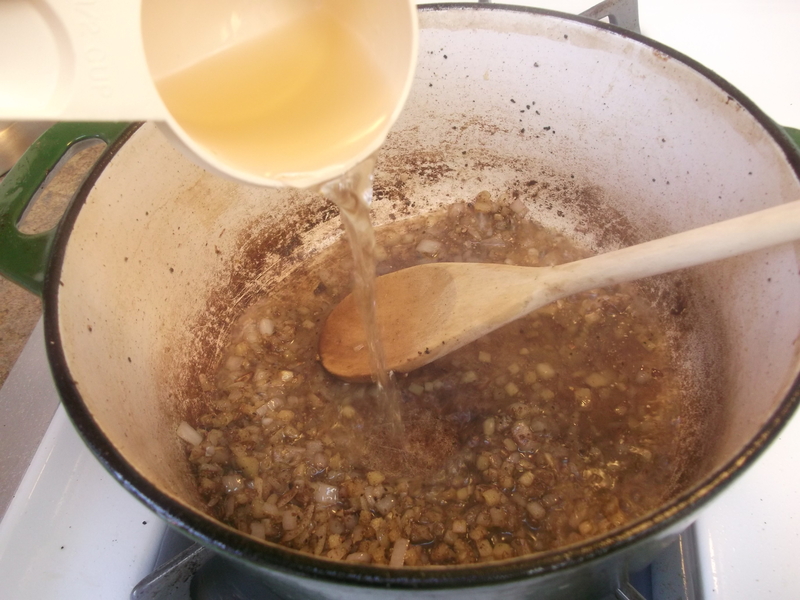 Pour in the sherry, scraping the bottom of the pot to release any browned bits, and reduce the liquid by half, about 3 to 4 minutes. Add the chicken stock, honey, and orange juice and stir to combine. Return the chicken pieces and any accumulated juices to the pot, toss the chicken to coat and then turn them skin side up, and bring the mixture to a boil. 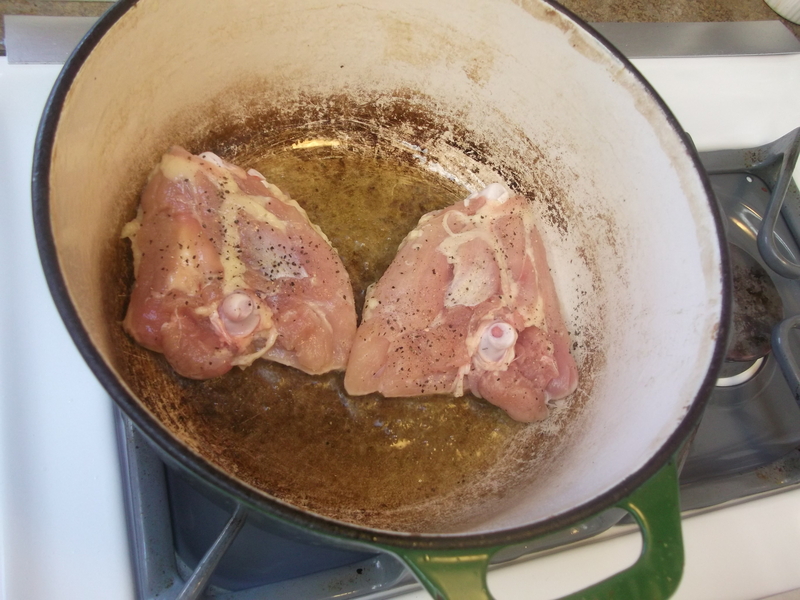 Reduce the heat and simmer until the chicken, when cut with a knife, is no longer pink, about 30-40 minutes. Scatter the rhubarb pieces between and around the chicken, and return to a gentle simmer until the rhubarb is tender, about 10-15 minutes more. 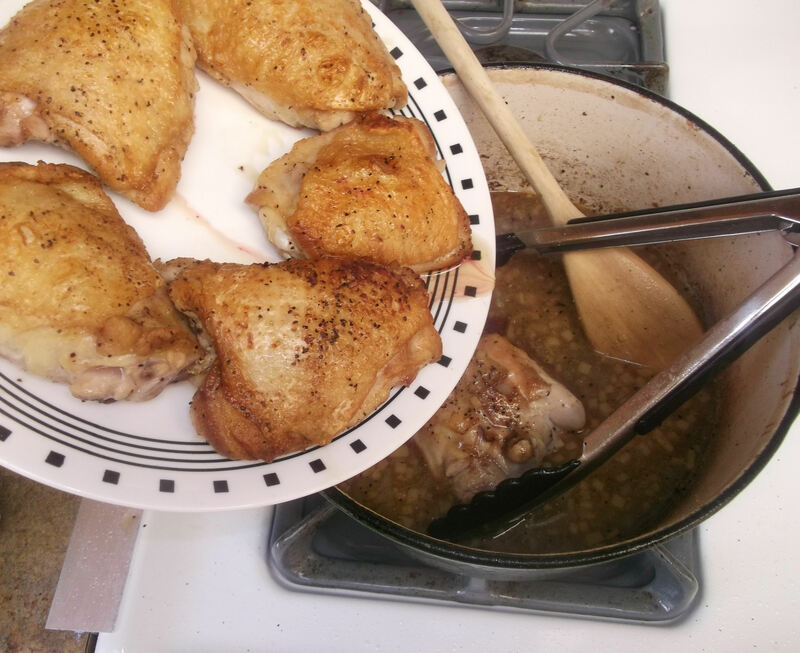 Pat the chicken thighs dry with paper towels: make sure the chicken is very dry or it will really splatter when added to the hot oil. Season both sides with salt and pepper. Heat the oil until shimmering, then add the chicken, skin side down first, and brown it in batches. Don’t overcrowd your pot – just put in as many comfortably fit. Think Business Class, with adequate room to stretch and move, not cramped like Coach. Be careful when turning the chicken, as it will splatter, and that oil is hot! Use long tongs, and wear long sleeves or a good oven mitt. 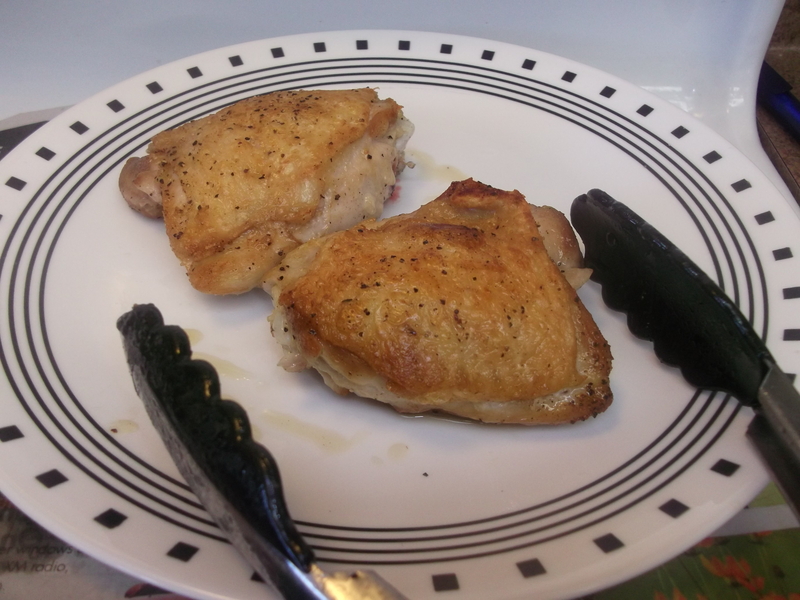 Set aside browned chicken on a plate and continue with the remaining pieces. While the chicken is browning, you can get the rest of the ingredients ready to go. To make things go a little faster later, after measuring everything out, put all the liquids (except for the sherry) together in one cup, and all the “solids” in another. You’ll get a head start on cleanup as well. When all the chicken has been browned and removed, reduce the heat to medium and remove all but about 2 tablespoons of fat from the pot. Add the “solids:” the shallots, ginger, and cardamom. 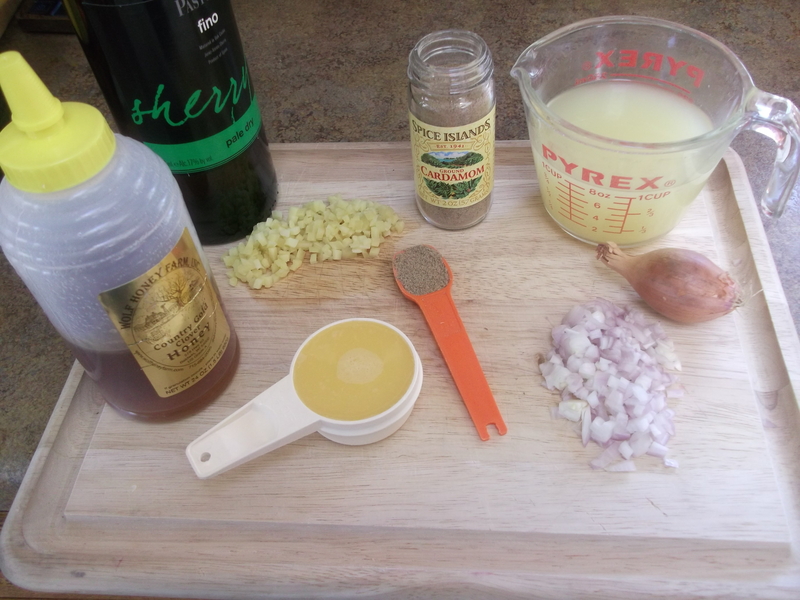 Sauté until the shallots soften, about 2 minutes. Pour in the sherry, scraping the bottom of the pot to release any browned bits, and reduce the liquid by half, about 3 to 4 minutes. Add the remaining liquids: the chicken stock, honey and orange juice. Stir to combine, then return the chicken pieces and any accumulated juices to the pot. Gently coat each side of the chicken, and leave each piece skin side up. Bring the mixture to a boil, then reduce the heat and simmer for 30-40 minutes.You can leave it uncovered or about 3/4 covered. I don’t notice a big difference. 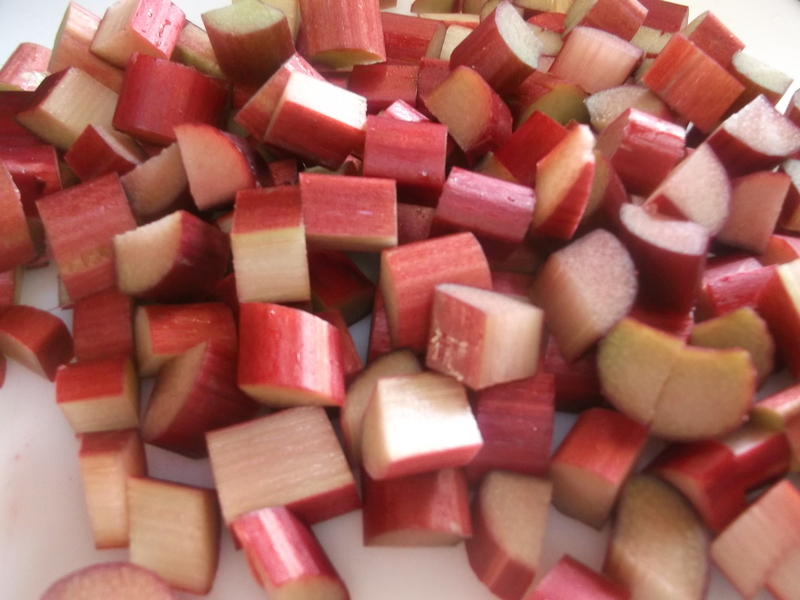 While the chicken cooks, dice the rhubarb into ½” pieces. 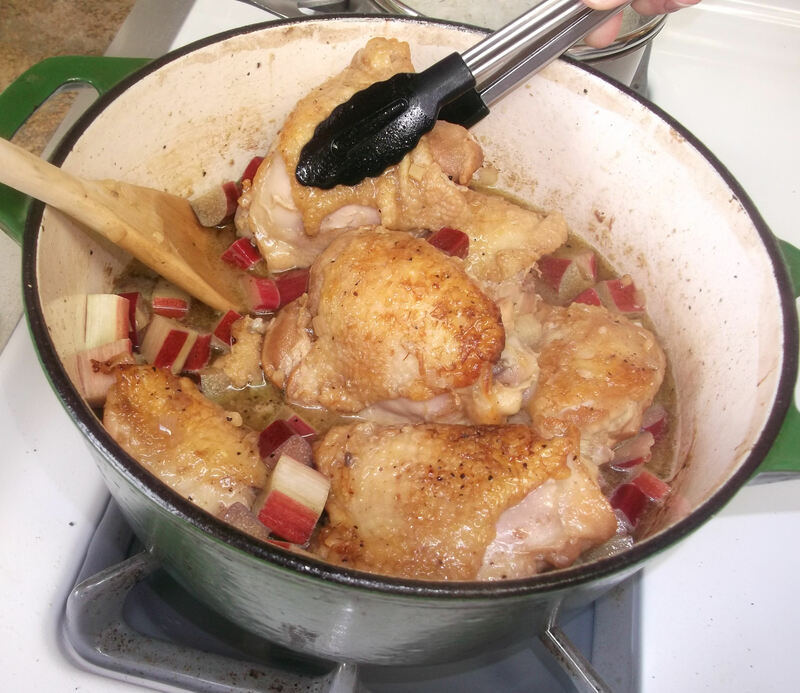 Add the rhubarb to the pot and use tongs to pick up each piece of chicken (gently, it’s very tender now and may fall apart easily), and then use a wooden spoon to coax the rhubarb underneath and between the pieces of chicken. The rhubarb needs to simmer in the sauce, so really get it under the chicken. Return to a gentle simmer just until the rhubarb is knife tender, about 15 minutes more. Serve with basmati rice and enjoy!